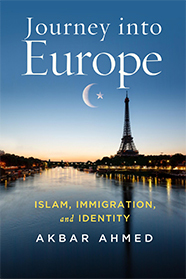 Journey into Europe | Akbar Ahmed embarks with his team across Europe to study the experience of Muslims. In the eyes of most Europeans, Muslims have come to represent fanaticism, fundamentalism, and female suppression, subjugation and repression. Antidote to such an alarming trend is the most recent book of Akbar Ahmed, Journey into Europe: Islam, Immigration, and Identity. It is an original and unique contribution to the expanding literature on Islam in Europe for several reasons. First, as an anthropologist, Ahmed breaks away from the usual solitary work of the researcher consigning his observations into a notebook. Instead he works in team with young scholars of different ethnic and religious backgrounds who offer fresh and diverse perspectives on the situation at hand. Second, this team work is a great asset for presenting the diversity of Muslim voices in Europe, while most of the essays or scholarship on the topic tend to shed light on one particular group at a time.